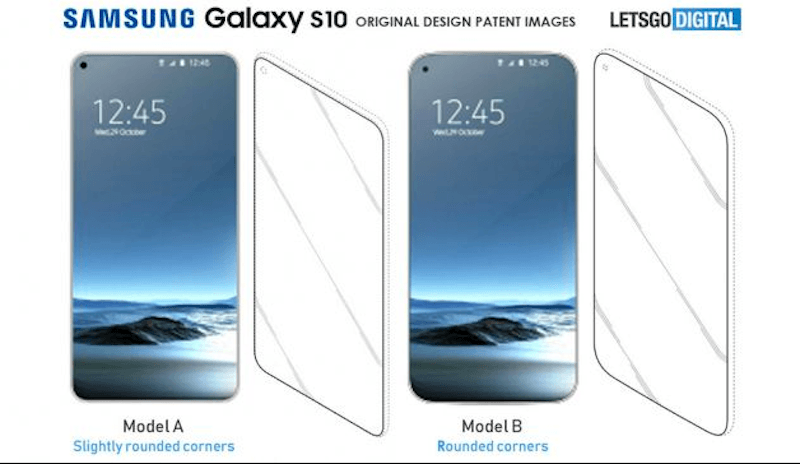 Samsung’s next flagship offering, the Samsung Galaxy S10 which will likely release sometime in the first quarter of next year is going to be a big step up from the previous phone. While the Samsung Galaxy S9 was a progressive update from a device earlier, many are expecting a breakthrough in terms of design when it comes to the Samsung Galaxy S10. We have already seen a lot of renders, rumours, leaks and speculations about the Galaxy S10 and the stream doesn’t seem to be stopping. At the recently held Developers Conference, Samsung showed off its different notch implementations which are the Infinity-U, Infinity-V and Infinity-O displays, with the cut-outs being of the same shape as the respective letters. Also, a patent application image of a new Infinity-O display has surfaced which points towards the possible design of the Samsung Galaxy S10. These new patent images have been spotted courtesy of the Dutch site LetsGoDigital, which gives us a full-fledged illustration of how the Infinity-O display might look like. The Infinity-O display, as demonstrated by the new pictures will feature punch-hole style cut-out for the front-facing camera. Now we already know that Samsung is one of the rare manufacturers in the market, which has strictly decided not to implement the notch in its phone and is relying on its Infinity displays to achieve more permanent, bezel-less and edge-to-edge solution for its screens. These new patents seem to be a step ahead in this regard. The submission comes with a lot of similar illustrations which are experimental cutouts for the Samsung Galaxy S10 hinting towards how the phone might look like. However, it’s clear that Samsung is putting a lot of emphasis on the Infinity-O display rather than anything else. The Infinity-O display which has been depicted in the pictures comes with a punch-style hole cut-out on the upper left-hand side of the device. Further, there are two designs implemented for the form factor, one with more rounded edges and the other one with slightly rounded corners. Additionally, there are also different layouts submitted with curved, square and flat displays. As per the report from the Dutch page, these patent applications were made to the Hague International Design System (specialising in industrial design patents), managed by the World International Property Organisation (WIPO). The images have also been uploaded to Hague’s bulletin page. With that being said, we are now sure of one thing, although Samsung might have brought little progressive updates on to its Samsung Galaxy S9, the next flagship phone by Samsung is probably going to be a big step up concerning design and display. Also, it’s entirely possible that with such a new display design and finally a replacement for the notoriously popular notch, Samsung might kick-start a new trend for smartphone designs.